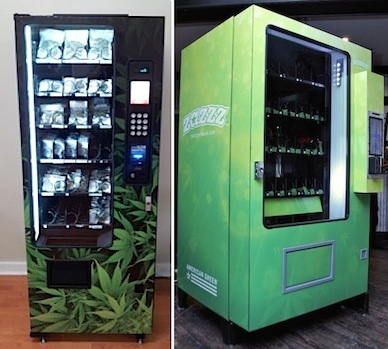 With North America’s governments finally beginning to capitalize on the millions and millions of dollars generated by the distribution of marijuana, we’re hearing about the very first vending machines designed to dispense sweet sticky herbs. While there are reportedly others in Arizona and California, the most publicized machines reside in Avon, Colorado and Vancouver, B.C. So who has the better machine? ‘Merica, or those maple-syrup guzzling ladies and gents to the North? It’s a matter of taste (literally). But here’s the clincher, you can get half an ounce for $50 in Vancouver’s, which is insanely cheap, and there are also refurbished gumball machines near the larger one that shoot out $4 and $6 nugs. On the other other hand, the one in Colorado is in front of a smokehouse, so you can just wipe the barbecue sauce off your fat face and pound your fists against the giant green box full of cannabis cookies.